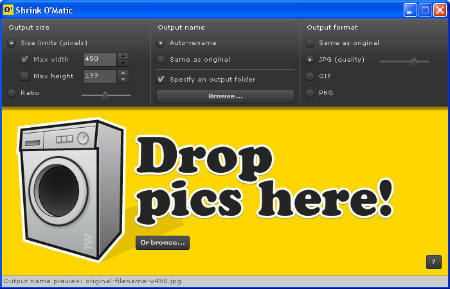 Shrink O'Matic is a freeware Adobe AIR application for resizing images of JPGs, GIFs and PNGs types. It has a simple gui and very easy to use. However, you need to have Adobe AIR installed to run. The simple interface with drag and drop feature are great. Betul Kujie. Memang mudah menggunakannya. Photostudio 2000 shareware atau yang datang dengan printer?